All West Valley College students, faculty and staff have full complimentary access to NYTimes.com* and NYT mobile apps**, thanks to the West Valley College Library college-wide NYTimes.com Pass* subscription. We encourage you to take advantage of the world-class journalism of The New York Times to enrich your educational experience. Once you register for an account you will have searchable access to articles, videos, blogs, features, interviews, obituaries, and columns. Note: If you are already registered at NYTimes.com as a non-paying registered user, select "Log in to continue" on the registration page to link your account to the one sponsored by West Valley College Library. To activate your free access to the New York Times, you must use the West Valley College NYTimes.com Pass link from this page. If you are off campus you will be prompted to enter your name and West Valley College ID number. Once you activate your account, you can access your account on NYTimes.com, INYT.com and NYT mobile apps from any location, on or off campus. 1. Click on NYTimes.com Pass. click on Advanced or Continue and proceed/accept as this is a safe connection/site. 2. Create your free account (You have successfully claimed a Pass when you see the Start Your Access screen). Your account will be active for one year from the date you register. Once your account expires, you will need to use the NYTimes.com Pass link on this page to reactivate it. Download your NYT apps by visiting nytimes.com/mobile. *Does not include e-reader editions, Times Insider content or digital versions of The New York Times Crossword. This program provides only select access to The New York Times Archive and does not replace database services to which your institution may currently subscribe. Other restrictions apply. **Mobile apps are not supported on all devices. NYTimes.com is a multi-platform news tool that provides full access to New York Times and International New York Times content, including breaking news, multimedia, reviews and opinion, blogs, videos and more. NYTimes.com is updated 24/7 with corresponding time stamps. From the home page, one can access more than 25 Times sections, including World, Politics, New York, Opinion, Business, Technology, Science, Sports, Arts, Fashion & Style, and Video. In addition, you will be able to share content on social networks, save articles of interest, subscribe to email newsletters and set up personalized alerts. 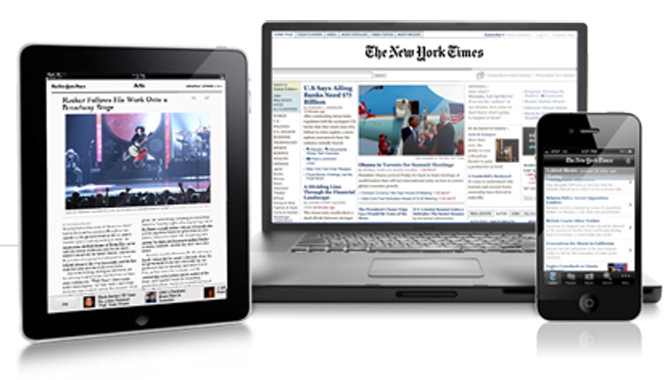 Your access to NYTimes.com is available from any location, on or off campus. NYTimes en Español is free for all readers. It contains original journalism in Spanish, plus translated New York Times articles. NYTimes.com provides 30+ daily and weekly newsletters on topics such as Top Headlines, Breaking News, Small Business, Movies Update, and Cooking, delivered directly to the user’s inbox. Its most recent, ‘What We’re Reading’ email newsletter features a roundup of great reads from around the web, chosen by New York Times reporters and editors. Custom alerts can also be created to monitor when specific keywords appear in NYTimes.com. Times Wire is a continuous stream of the latest articles and blog posts published on NYTimes.com.